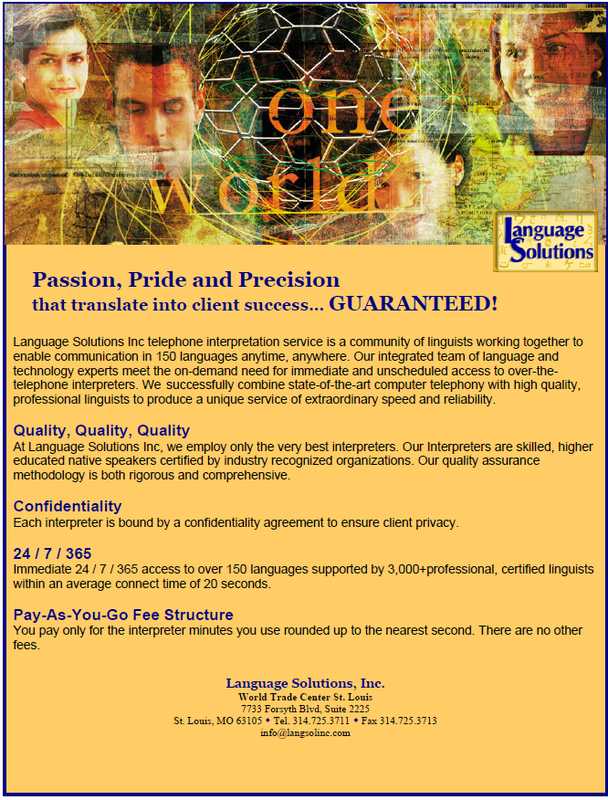 Oral Interpreting Services | Language Solutions, Inc. Interpretation is the verbal translation of spoken language. 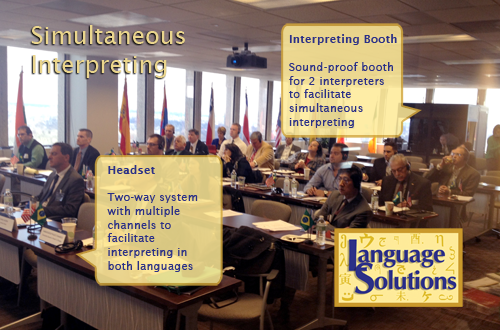 Language Solutions provides both in person Simultaneous Interpreting and Consecutive Interpreting services. We also provide Over the Phone Interpreting services. Our interpreters are bilingual/bi-cultural professionals trained to bridge language barriers for effective communication. The interpreter’s primary role is to facilitate clear and effective communication and to serve both parties in a neutral manner. Contact us to discuss your interpretation needs and which option would work for you. We can develop specific recommendations for your project, including a certified team of professional interpreters and equipment rental. Consecutive Interpretation is when the interpreter speaks the message in the target language after the source language speaker pauses. Simultaneous Interpretation is when the interpreter immediately speaks the message in the target language while listening to the source language speaker who continuously speaks. Simultaneous interpretation often takes place during large professional conferences. The interpreters listen to the source language speaker through earphones. They speak the message into a microphone. The interpretation is broadcast directly to conference attendees who wear special receiver earphones. Simultaneous interpreters work in teams, alternating every 15-20 minutes due to the intense nature of this service. Setting up a conference and need to get organized? Contact us to send you our Checklist for Conference Organizers and our Checklist for Hiring of Simultaneous Interpretation Equipment. within an average connect time of 20 seconds. Each interpreter is bound by a confidentiality agreement to ensure client privacy. We have State Certified and Federal Certified court interpreters available for court depositions and Grand Jury trials. We also provide non-certified court experienced interpreters. Court interpreting cases are highly specialized. All of our interpreters are competent court interpreters and understand court procedures. Based on the nature of the case, they are also subject matter experts and understand the terminology used in the case. Court interpreters are there to assist the attorney and their client to ensure that justice is carried out fairly for defendants and other stakeholders. Having a competent objective interpreter helps to move the process forward efficiently and effectively. We work with insurance agencies, doctor offices and law firms and provide interpreting services for worker’s comp cases on a regular basis. Our interpreters assist with doctor/patient visits to provide objective and clear communication. Having a competent interpreter in place instead of a family member or friend avoids confusion and disruption that can prevent the patient from timely treatment. Doctor visits and medical procedures can be costly and time consuming. Our interpreters are trained in the Bridging the Gap program – a nationally accredited interpreting certification program for Health Care interpreters. Our interpreters can help move the process forward to get the patient back to work and manage costs. Interpreters for legal depositions are typically requested by the attorney for either the defense or prosecution. The interpreter is there to be an objective person and to only relay what is spoken. Therefore, it does not matter which side requests the attorney as there is no preference in interpreting given to either side. Interpreters for depositions are those interpreters that have experience in a legal setting. When you request your interpreter, we will ask questions such as the nature of the case (to help the interpreter prepare for the subject matter), the name of the person to be deposed (to ensure that there is no existing relationship with the interpreter), the time, date and other details. We can also call your client to confirm the time and details to make sure they show up. Call us to handle the interpreting services of your next deposition. We will ask you the questions as well as send you a checklist of information that you can use on your end to help you organize your event. Independent medical exams (IME) are typically requested in Worker’s Compensation cases. We will work with you to help coordinate the right interpreter with medical expertise (experience interpreting in a medical setting) for these type of cases. The interpreter can also arrive early to help your client fill out the paperwork at the doctor’s office. Just let us know that your client needs assistance with this. When you call to request your interpreter, we will ask you for nature of the setting (such as IME), time, date and other details as well as your client’s name (to ensure there is no relationship).